Black and blue. It’s not just for bruises, it’s also the term for ultra-rare steak—quickly seared on the outside, and practically raw on the inside. And this is how my caveman Kid orders it. Children can have unreasonable fears installed by the words and actions of adults. Myself, it’s pressure cookers. 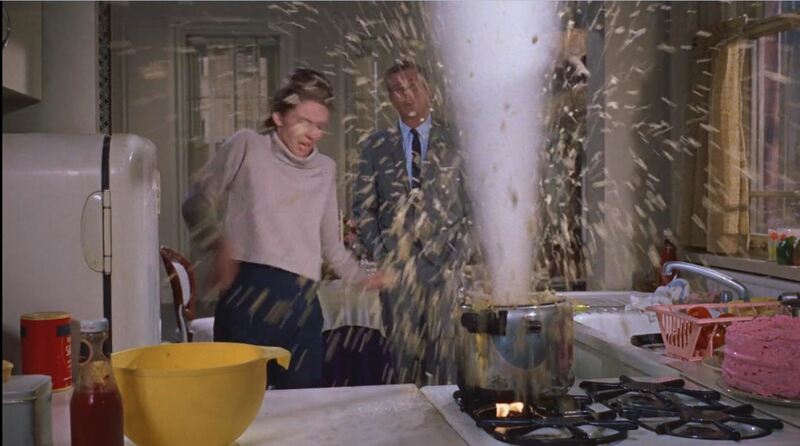 When my mother used one, she acted like she had a thermonuclear device in a pot on the stove. There’d be lots of, “Get back!”, “Don’t touch it!”, “It’s gonna blow!”. Breakfast is canceled at Tiffany’s. To this day, even though I’m pretty sure that pressure cookers can probably be safe, I’ve never owned one, and am uncomfortable around them. It’s the potentially lethal combo of heat and pressure, with the added hazard of food shrapnel. My mom is the same way about undercooked meat. Pork? OMG. She’s convinced that if there is any juice left at all in the pork all diners will be dead before morning. And beef cooked anything less than tanned hide also caused fear and revulsion in my mom. But, I developed a taste for severely rare beef, which I passed on to The Kid. My mom’s recipe for roast beef was an eye of round roast that she would cook all day in a crockpot with an envelope of onion soup mix and a little water. Consequently, it was taupe and tough. I just assumed that this was the best an eye of round could hope to be. 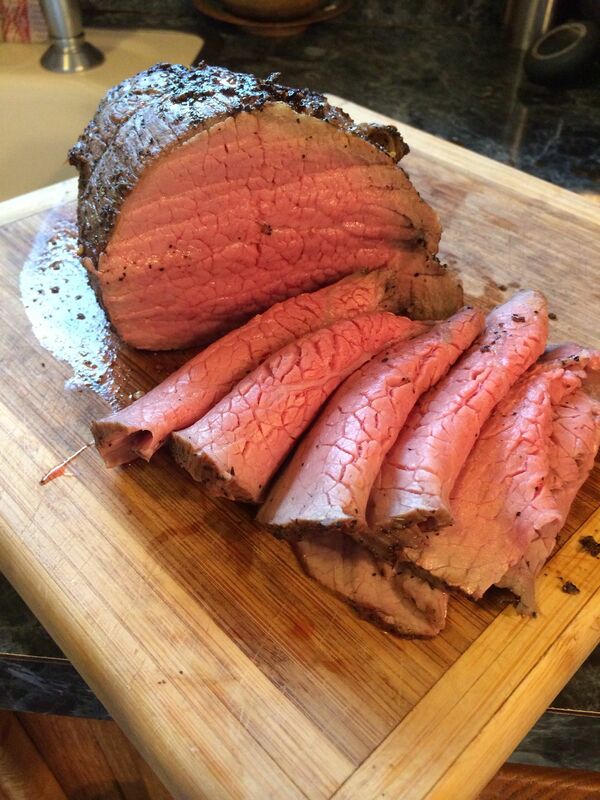 But then I saw online and on TV that this cut could make a nice roast beef. 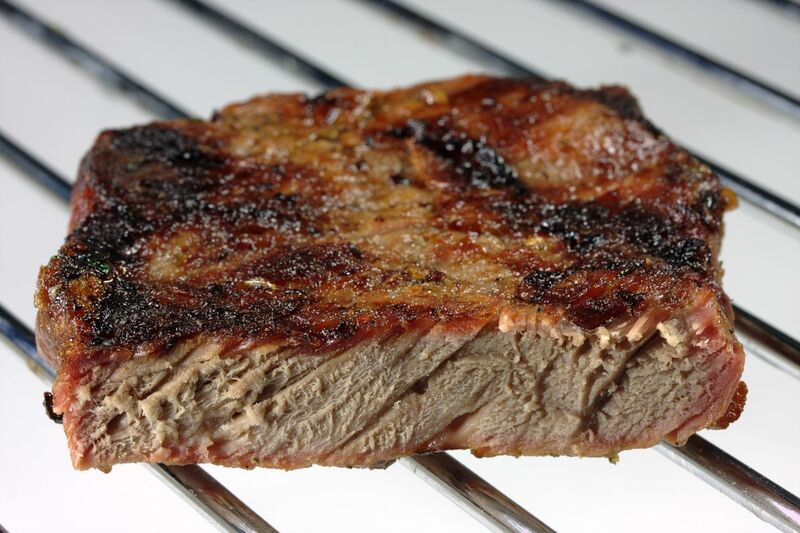 But because it’s a pretty lean piece of beef, it could only be cooked until it reached 125-130 degrees, max. Every extra second in the oven makes it tougher and drier. So, I started researching recipes. And found technique was the important factor in a nice roast beef. And even better, it’s a relatively cheap cut. Three days before cooking, Sprinkle 2 teaspoons salt all over the entire surface of the meat. Place into zip-top bag and let thaw in fridge. Cooking Day: Preheat oven to 325 degrees. Mix the rest of the salt with pepper, garlic powder, thyme, and mushroom powder. Dry off beef with paper towels, then coat with salt herb mixture. Heat a heavy skillet on stove and add butter and oil until melted and foamy. 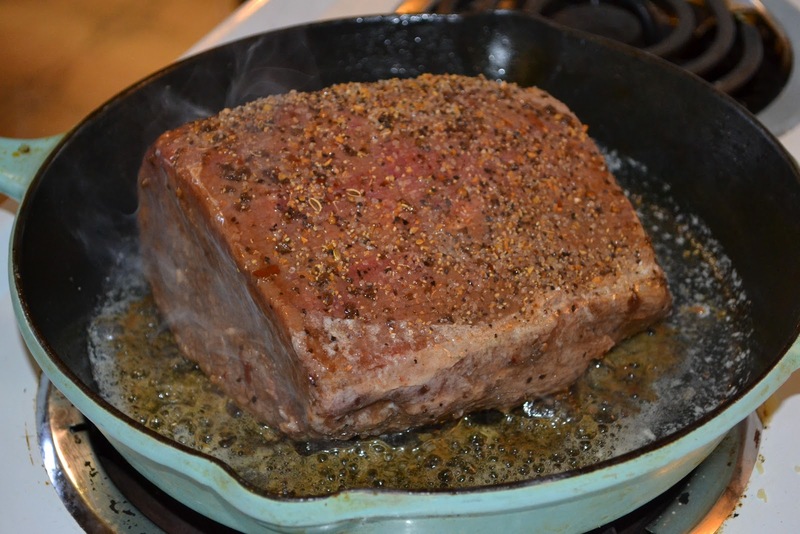 Place beef in skillet and sear on all sides. Place probe thermometer into the center of the meat set to 123 degrees. Place skillet with beef fat side up into oven and cook until temp is reached. Take out of skillet and place on a cooling rack over a shallow sided pan. Leave thermometer in while resting, so juices don’t run out of the hole. Cover loosely with foil and allow to rest for 15-20 minutes (the internal temp will continue to rise about 5 more degrees while it rests). Slice very thinly and serve hot with horseradish cream. Serves four. Leftovers make killer sandwiches. Stir remaining horseradish cream into some mayo for the perfect sandwich dressing. In addition to a beautiful, inexpensive roast beef, I leave you with this advice. Try very hard not to infect children with your own fears and prejudices, in the kitchen or out. The only major fear I know for sure I preinstalled into The Kid? Overcooked steak. This was great! I appreciate the humor with the Pressure Cooker (I actually blew the rubber seal off the top of mine), Soup broth on the ceiling. I especially like the “food shrapnel” remark.